The holidays are over and January is here! Or rather, January has been here for some 20 days or so. Whoops! Better late than never, right? After all the madness of traveling for the holidays, it took me some time to get back into my routines. My planning and scheduling took a major hit during this unproductive time, but I’m finally finding my way back onto the horse. So at long last, I present to you my January 2018 monthly setup! Ever since A Month in Color, I’ve been having a blast combining my two passions of painting and planning. It hasn’t been a perfect relationship, but I feel like I’m making progress in my goal of drawing and painting every day. I’m not there yet, but I’m much closer than I used to be! But for my January monthly setup, I really struggled with settling on a design style. In December, I tried brainstorming to no avail. In early January, I still couldn’t figure out what I wanted to do. So when we got back home around January 10th, I had no particular plans for my January setup. It was starting to freak me out, I’m not gonna lie. Finally, I locked myself in my office with some fabulous music courtesy of Prime Music (get your 30 day free trial here!) and my brand new Sennelier watercolors for a serious brainstorming session. That did the trick! I even managed to capture the process in a vlog, which turned out way better than I expected. With the concept in mind, I was finally able to tackle my long-overdue January setup. I decided to keep my design pretty simple – no crazy linework, drawings, or lettering. Instead, I opted to rely on the fantastic mixing power of the Sennelier watercolors. The way they move on the page is sensational. So I thought I’d try a sort of pastel galaxy design, much like these galaxy sea turtles that I painted a while back. To begin, I used the masking tape to block off any sections I wanted to keep white, like the calendar boxes. Then I used clean water to get the paper wet for a wet-on-wet watercolor technique. Once the page was nice and damp, all I did was start adding paints here and there until all the colors had covered the page! While the paint was still wet, I dotted clean water or another pigment into the areas of color to get those cool starburst effects. After everything dried – and I mean bone dry – I took my Dr. Ph. Martin’s Bleedproof white and painted it onto an old toothbrush. Then I just dragged my thumb through the bristles to create all those itty-bitty specks of white. It’s a messy process, but you can’t deny that the results are stunning. When all the watercolors and white specks dried, I could pull up the masking tape to reveal the white blocks of paper. Then it was a cinch to use a pen to letter out headers and number the calendar boxes! Since I was struggling so much to get this one done, I decided not to try and make any edits to my layout. Everything is pretty much exactly the same as December’s layout. The only change I made was teeny, and that was slightly rearranging the order of my memory log columns. My habit tracker is a direct copy of December’s, and my calendar is nothing fancy. I’m afraid I have nothing exciting to report on this section! 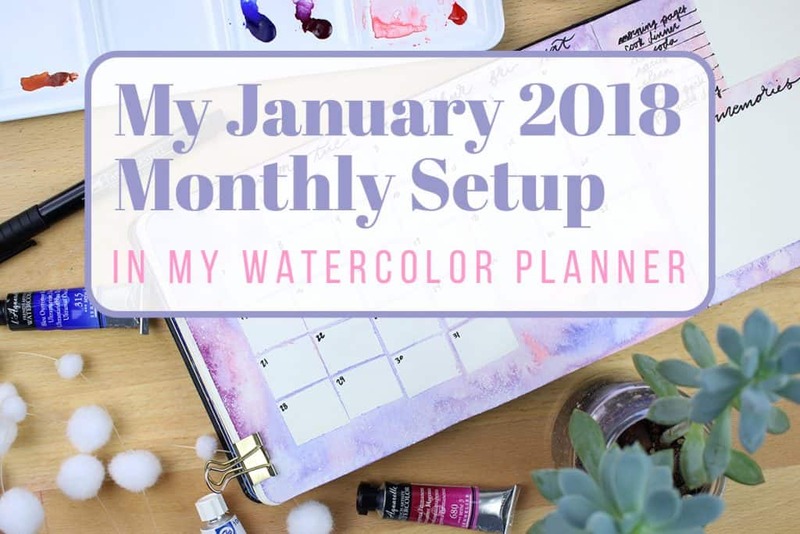 I had a ton of fun getting my January monthly setup completed, despite all the blocks I had getting started. Pushing past my uncertainty and coming up with a finished spread is always something that feels good, but I’m especially in love with how this one turned out. Getting through this monthly and getting it published feels like I’m hitting a restart button on my schedule and I can really get on with my life after the holidays. I feel refreshed, accomplished, and ready to go. Now hopefully I can get my February monthly set up done before Valentine’s Day! I’ve enjoyed all your watercoloring—so lovely and inspiring! Also, gorgeous music selection in the video—what’s the artist/title? 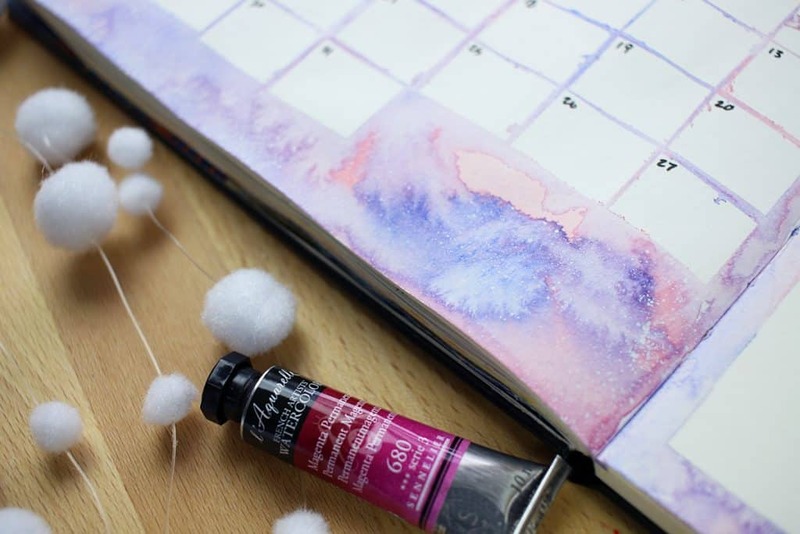 how do you keep the watercolour, paints, etc. from bleeding over? beautiful. thank you for being a source of much needed inspiration! Thank you for sharing all your creative work. You have really inspired me to get back to art. I always felt like mine was never good enough 🙂 We are our own worst critics! But, better done than not at all. 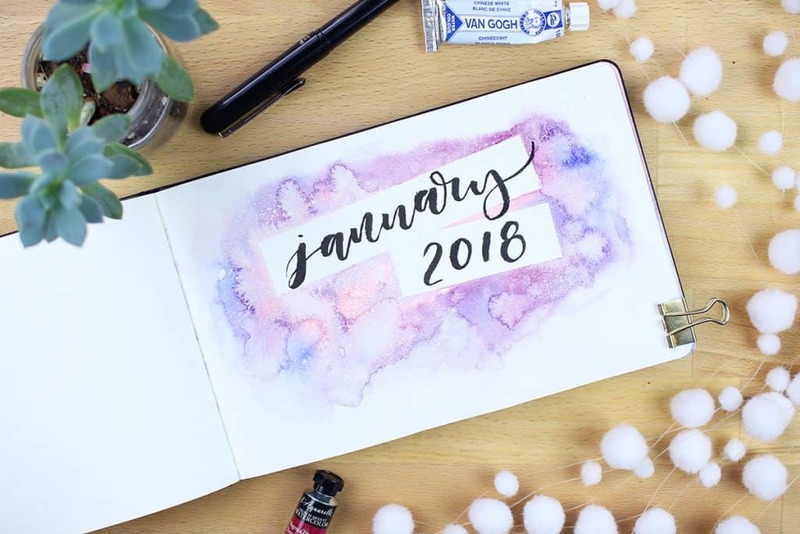 Your January spread looks beautiful. 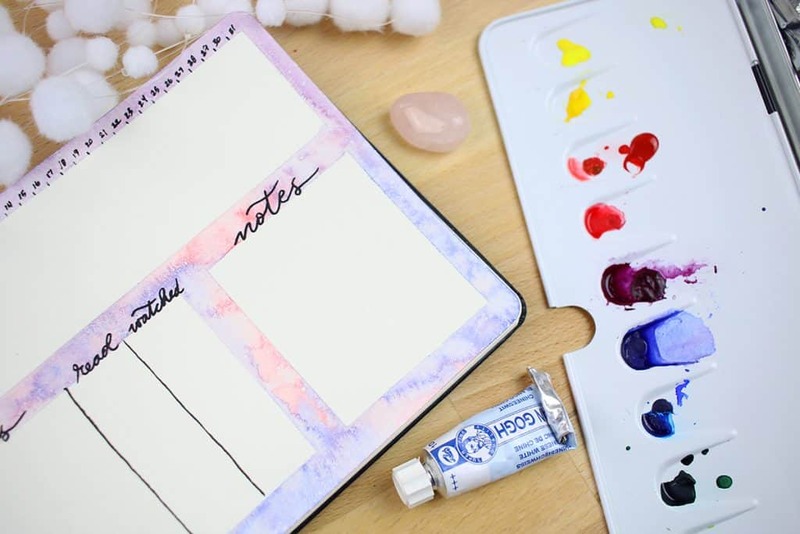 I really want to try bullet journaling at some point, but just don’t have the time at the moment. But I am definitely making notes for when I do! 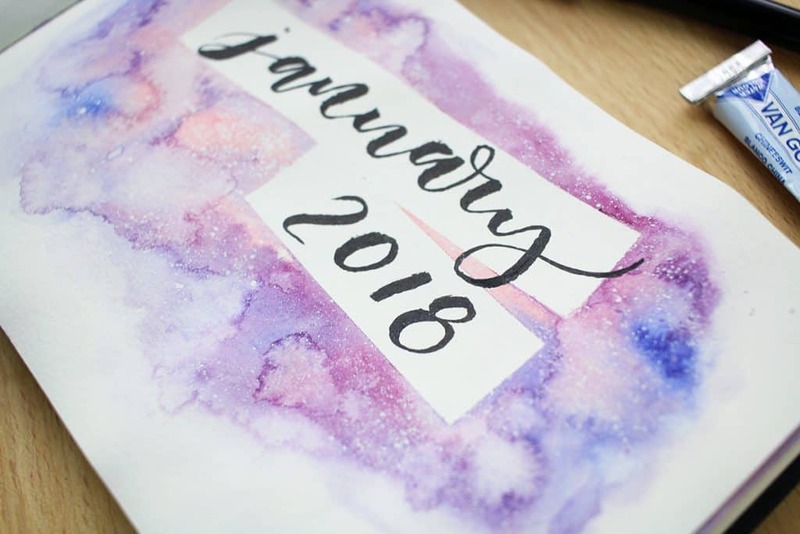 Absolutely love the technique of using masking tape with watercolors! It really worked well Michele! Well done Shelby! I LOOOOOOOOOVE the pastel galaxy, and your video music was a perfect interpretation of your piece…. Beautiful and serene. Just gorgeous. Thanks for sharing. Glad to hear you enjoyed it Dawn! Looks amazing! Really balanced. I envy your painting skills. What a creative mind you have. It feels peaceful just reading your website. Thank you so much for being here Brenda! This is beautiful to watch! And I just got my Christmas cards out last week, so you’re not the latest on this at all LOL. Thanks so much Shelley! At least you got them out, right?! I do not speak the language here!) and a lot more yet to come. 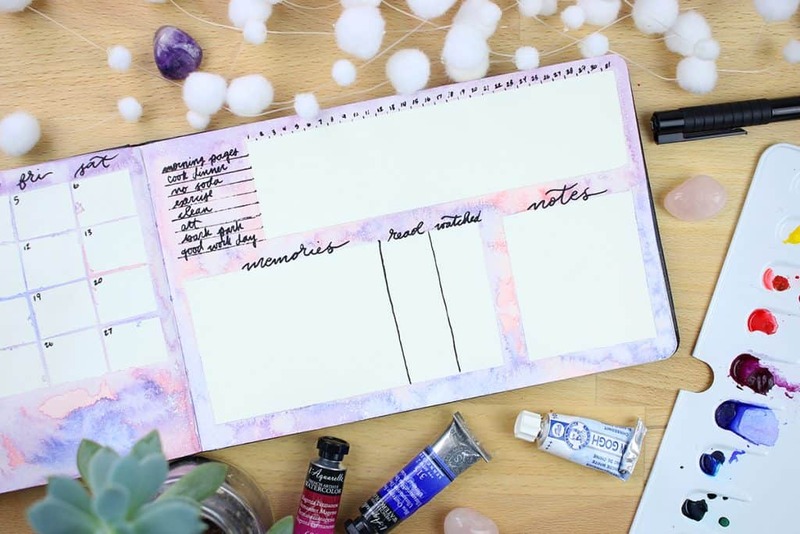 And of course the new year added journal set up things to do for the year. I am back on track – thanks. Wow Shirley, that is a HUGE change! I’d say it’s pretty understandable that your January set up is a bit late. That was beautiful!!! Thank you so much for sharing that with us! Happy to hear you enjoyed it Doran!